THIS IS A VERY NICE AND DRAMATIC EXAMPLE OF A MISPERFORATED STAMP. 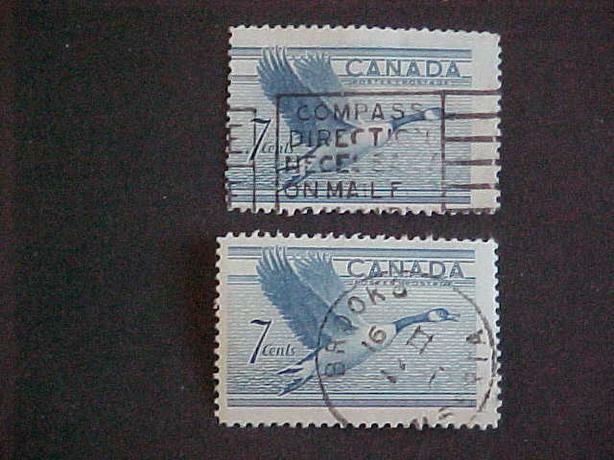 IT OCCURRED ON SCOTT 320 THE 7 CENT NOVEMBER 3, 1952 WILDLIFE CANADA GOOSE STAMP. IT IS A USED STAMP AND IS IN VERY NICE CONDITION. FOR OTHER ITEMS OF PHILATELIC INTEREST ESPECIALLY ERROR STAMPS INCLUDING TAGGING PLEASE VISIT MY OTHER ADS.